In 1961 Arne Jacobsen beat the rest of the competition to design the Danish national bank in Copenhagen. This clock you see before you is known as the bankers clock because it was first introduced to the world as the clock that stands proud in the 20 metre high lobby of the national bank of Denmark. So not only did he design the Bank but he also had foresight to use the National Bank to promote his own product which was a stroke of genius that has helped the bankers clock reach a design icon status. The clock has subsequently spawned a range of watches and wall clocks since that all boast the same design language but the most classic is the bankers wall clock seen here in 29cm diameter. The wall clock comes in 4 different sizes from 48cm to 16cm and it’s most striking feature is the domed glass front. Wrist watches are also in the range that also feature the domed front and distinctive number system. My one cost £240 and is a good size for a standard wall clock but the larger one can be used if you want a feature focal point more than just a wall clock. Or if you just have a bigger house than me. Obviously that’s more than your average wall clock but few clocks have so much history and when spending more money than usual on something I am a sucker for a back story. Arne Jacobsen is an almost integral part of Danish culture, and as such, modern contemporary design so if you can’t afford one of his chairs or lamps then the clock is good way to have some legend in the house. Arne Jacobsen sadly never got to see the finished national bank as it was completed in 1978, 7 years after his death. But the legacy of his design lives on and now has an entire range of watches and clocks behind it. 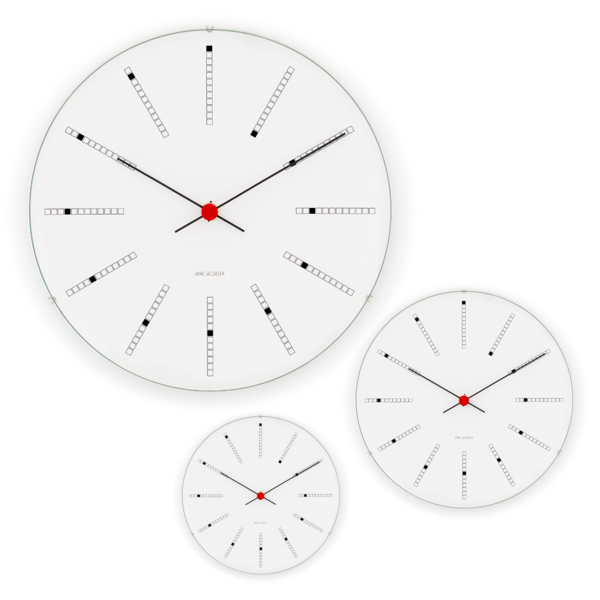 Of course that is just a brief history of the clock and there is plenty more to tell both on the clock and the history of Arne Jacobsen himself. If you like the clock I would definitely recommend it and if you have not heard of Arne before then check him out, his work is legendary.